Sold by each. NEW PEBBLE ! 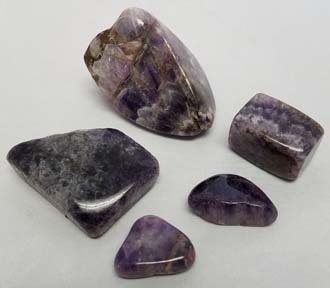 Moroccan Amethyst pebbles add to our growing lineup of polished pebbles. 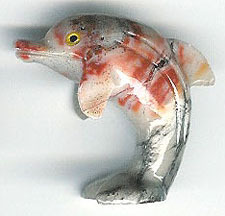 Similar to "Chevron" in appearance with traces of red thoroughout. Prices range from $1.00 to $3.00 each. This 1/4" - 1/2" Super Mini Dyed Tumbled Stone Mix from Brazil is good for mining pan operations and craft projects. Price is $1.00 each, sold in bags of 100 pieces. 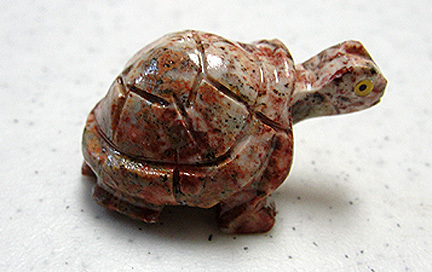 Approximately 1/8 inch thick by 1" to 2" approximate width and 2.5"-3.5" approximate length. Size and Shapes of slices will vary. Slices cost $1.00 each and must be ordered in 100 piece lots. Available in Natural and Assorted packs. 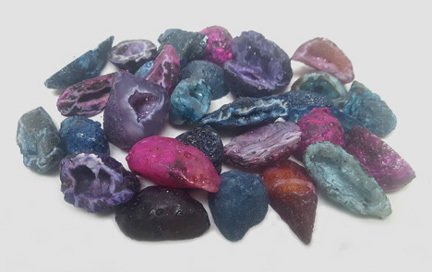 Assorted packs include Pink, Purple, Teal, Blue, and Natural. 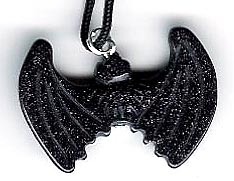 Bat Carved Gemstone Necklaces from China come in a variety of stone types and are on a 24 inch cord. Available in assorted only, no request for specific stone types will be honored. Price is $21.00 per lb, sold in 1 lb bags. 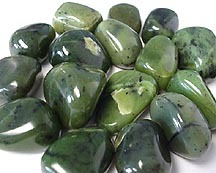 Canadian Jade Tumbled Stones is a large sized polished tumbled stone and varies between 1" and 1.25". 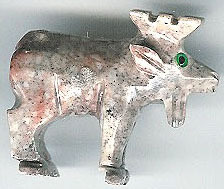 Jade (also known as Nephrite) is an ornamental mineral, mostly known for its green varieties, which is featured prominently in ancient Asian art. Metaphysically, Jade is often used in dream work to help with lucid dreaming and with remembering dreams. It also carries a revitalizing energy that can help to speed healing. NEW PRICES AND SIZING!!! Price is $.75 each sold in bags of 25 pcs or $.35 each sold in bags of 100 pcs. These new Agate Replica Arrowheads are have more distinct colors and shine than our Chert Replica Arrowheads. Sorry but we cannot hand select colors, sizes, or styles for you. Handcrafted and created in the same fashion as in ancient times. 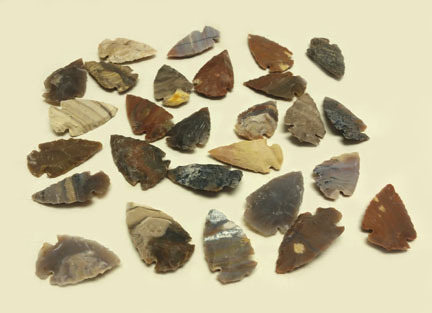 These arrowheads have some variation in color. 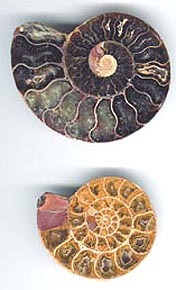 Size ranges from approximately 2" - 2.75" for the regular and 1.25" - 1.75" for the small. 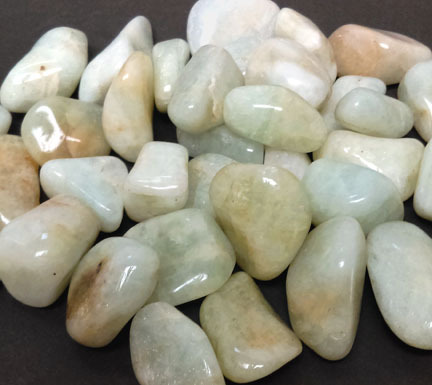 Amazonite Tumbled Stone is available in two sizes: Medium and Large and are sold in 2.5 lb bags. Medium stones are approx 3/4". 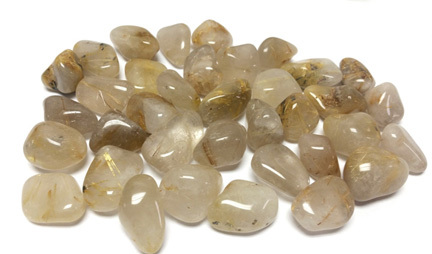 Large stones are approx. 1". 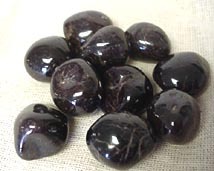 Garnet Tumbled Stone is sold in 1 lb bags and in 2 sizes: 3/4" Medium and 1" Large size. Price is $18.00 a pound, sold in 1 pound bag. Price is $18.00 pound, sold in 1 pound bags. 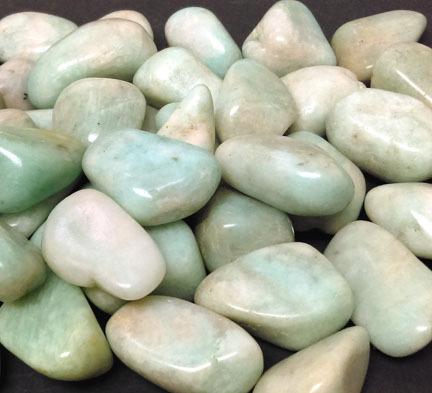 Aquamarine Tumbled Stone is sold in 1 lb bags and in 2 sizes: 3/4" Medium and 1" Large size. Price is $.75 each, sold in bags of 50 pieces. 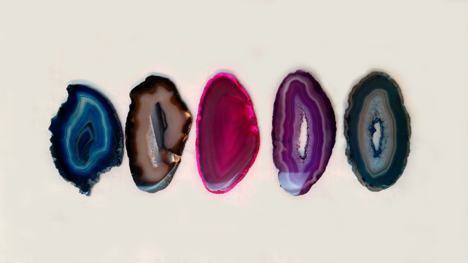 Mini Dyed Geodes Cut and Polished. Available in assorted colors only. Size is approximately 1 inch each.